Blue Eyed British Cats have beautiful and piercing round blue eyes. They typically have a gray, blue, or white coat, but can come in other colors as well, such as copper, brown, and black. They have a cherubic, round face, and a short snout, and pointed ears. Their cheeks are high and bulbous and they have circular whiskey pads, making their smiles especially animated. The Blue Eyed British Cats are famous for their expressive faces. Their personality and feelings shine through their faces, and they will not hesitate to tell you when they’re happy or when they’re displeased! Olga searched far and wide before finding the perfect British pair. The female came from a remote city in the far east of Russia called Petropavlovsk-Kamchatsky, and the male came from Zelenograd. Together they make the perfect couple! Blue Eyed British Cats come in both a short and longhaired variety. 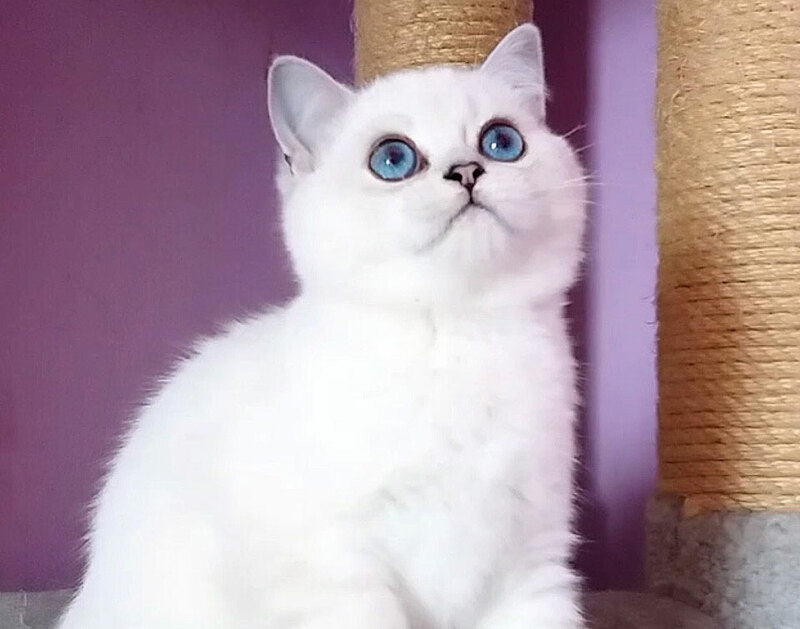 Blue Eyed Shorthair has a short, but plush and dense coat of fur. 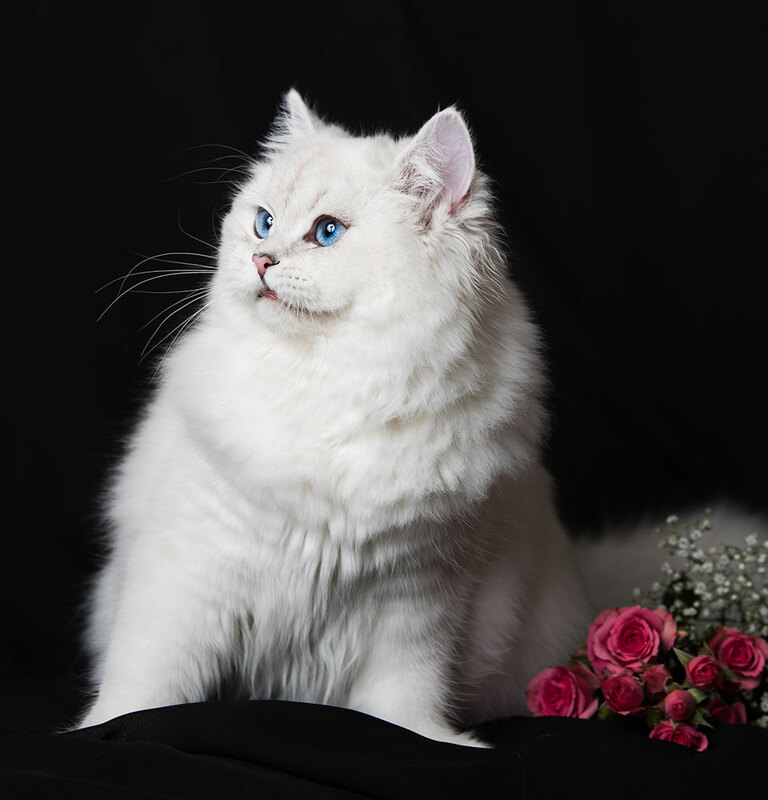 The Blue Eyed British Longhair is similar to the shorthair, but with a more deeply dense and longer coat of fur. Whether shorthaired or longhaired, their fur is soft and luxurious to the touch. While Blue Eyed British Cats range from medium to large sized, their dense fur adds to their size, making them appear even more magnificent. This is especially true for the Blue Eyed British Longhair. Blue Eyed British Cats require very little care, other than brushing to prevent matting of their fur. They are independent cats who love to follow around their owners. When left alone, they enjoy being sedentary and taking cat naps on the in the warmth of the sunlight. Blue Eyed British Cats are mellow and reserved, but fiercely loyal to their owners. While they enjoy the attention, Blue Eyed British Cats are perfectly content just following their owners around and quietly sitting by their feet. As kittens, Blue Eyed British cats are playful and energetic. However, as these cats mature into adulthood, they typically quiet down and become more easygoing. Often, the male Blue Eyed British Cats can be very goofy and silly, entertaining the whole family. A confident cat, they are not afraid of strangers or guests and will bask in any attention! This makes them the perfect cat for any family, and especially for families with children.